Mineral Point owes its name to lead and zinc deposits that were discovered there in the early 1800s while Wisconsin was still a territory. This set off the first mineral rush in the United States, leading to the immigration of a flood of hard rock miners from Cornwall, England, in the 1830s. The Cornish left their imprint in the form of limestone and sandstone homes and buildings which are now highly prized. Mineral Point boasted a population greater than nearby Chicago and Milwaukee combined in 1830. The railroad reached the city in 1857. 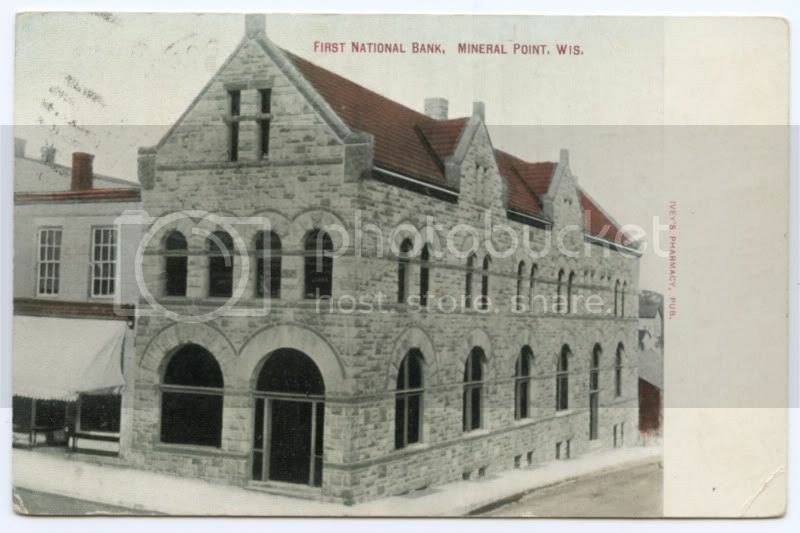 Bob McNeill requested a look at a proof from the issues of The First National Bank there, a small bank that operated from 1885 until 1909 when it was brought down by Philip Allen Jr., a trusted banker who was running a ponzi scheme with the depositors money. The bank had obligations of almost $700,000 when it closed, most to the residents of the town and surrounding Iowa County. Small numbers of notes were issued from the bank as its officers maintained their tiny circulation which topped out at $25,000. No notes have been reported from the bank yet.